Save SAR 20 (80%) – Earn 0 Shukrans What is Shukran? Shukran is the Landmark Group’s award-winning loyalty programme in the Middle East, which allows you to earn Shukrans when you shop any of our brands. 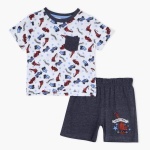 Soft and comfortable, this t-shirt and shorts set is sure to become your darling's favourite pick to wear at night. The t-shirt has a round neckline and short sleeves for added comfort, while the shorts have an elasticised waistband making it easy to wear and remove.